The Shaw Wildflower Market is geared for new and experienced gardeners and people looking for locally made products for a greener community, including local wildflowers, wine, bread, meats, cheese, art, beer, produce and more. 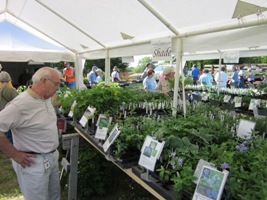 Wildflower markets occur in the spring and fall at Shaw Nature Reserve. A wide selection of Missouri native plants including trees and ferns are available. Gardening with native plants may soon become the norm rather than the exception in Missouri. The benefits of native landscaping are fueling a gardening movement that says “no” to pesticides and fertilizers and “yes” to biodiversity and creating more sustainable landscapes. Novice and professional gardeners are turning to native landscaping to manage storm water, reduce maintenance and promote plant and wildlife conservation. Why is purple coneflower better to plant than zinnias? Or butterfly milkweed better than day lilies? Find out in the latest “Get Wild, Go Native” feature with The Nature Conservancy’s Doug Ladd, director of conservation science in Missouri, and Scott Woodbury, a native horticulturalist with Shaw Nature Reserve. Rain gardens, bioretention and wetland detention basins are a few best management practices in use. They slow down and absorb rain water, thus reducing the quantity and velocity of storm water runoff while improving water quality. Compared with lawns and mulched tree, shrub and perennial plantings, landscapes planted with appropriate native plants require less maintenance. They require minimal watering (except during establishment and drought periods) and they need no chemical fertilizers or pesticides. A native plant garden with a diversity of trees, shrubs, perennials and grasses provides food and shelter for insects, birds, amphibians and mammals throughout the growing season. Leaving seed heads and plant structure throughout winter provides continuing food and shelter for many creatures and provides opportunities to observe nature up close. People who have lived in one place for a time develop images of their home that create a sense of belonging and familiarity. Those who have lived in rural Missouri know about flowering dogwood. For instance, its blossoms and berries have made their mark in the hearts and thoughts of so many Missouri residents that it is the state tree. Many people have recognized this heart-felt connection with nature, and it often is referred to as “sense of place”. Wildflowers, flowering vines, shrubs and trees offer a wide range of colors, textures and forms to create dynamic seasonal displays. Grasses and sedges have interesting flowers and seed heads and yellow–orange fall color. Shrubs and trees have fall color and berries that persist into the winter. Choosing a wide assortment of plants ensures seasonal interest, with the bonus of attracting colorful birds, butterflies and insects. Native Plant School is a year-round series of mostly outdoor learning sessions in the Whitmire Wildflower Garden at Shaw Nature Reserve. They will cover various aspects of native home landscaping. Please bring your questions, comments, photos, drawings, plant specimens, etc. for these three-hour discussion sessions. Scott Woodbury and guest experts will lead the discussions, hands-on tours and demonstrations. Participation from the audience is encouraged. 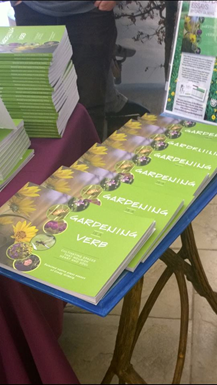 Long time contributor to the native plant gardening movement and our dear friend Cindy Gilberg wrote many essays about native plants over the years, and now they are collected in a new book, "Gardening is a Verb." The book is now available for $12 at the Shaw Nature Reserve and Missouri Botanical Garden bookstores. All proceeds benefit Shaw Nature Reserve.